In short: the Mitochondrion looks as stunning as I hoped for about five years ago. 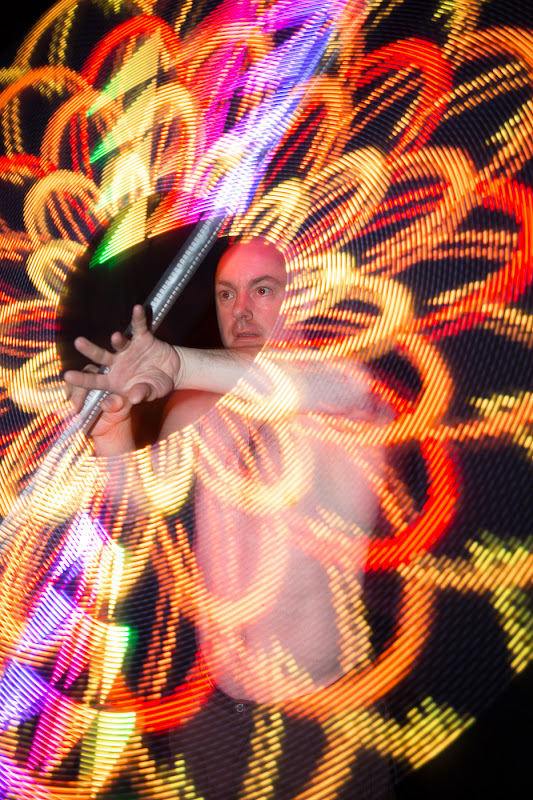 About five years ago, I stopped fire spinning and started building LED staffs. 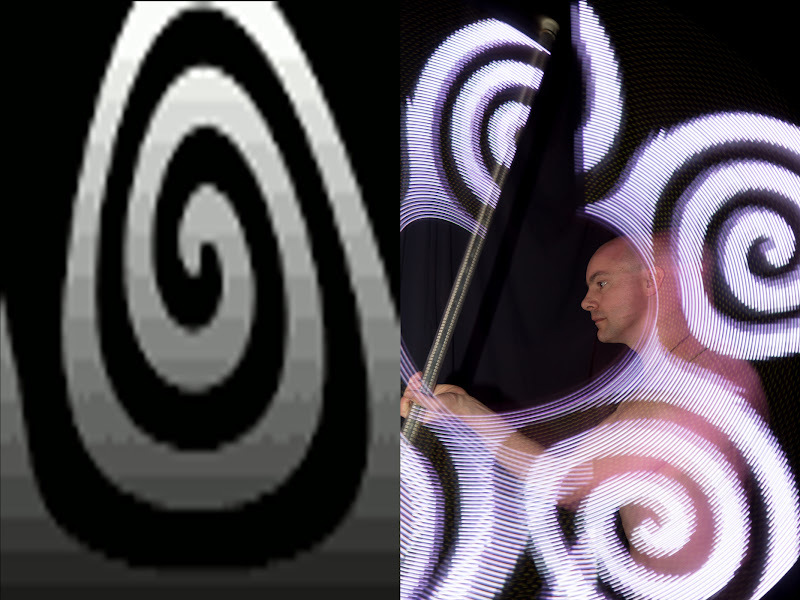 I wanted to have images hanging in space around me while I am spinning staff. Technology (and my skills) have finally got to that point where I’m pretty happy with the Mitochondrion, Mark 5.3. Mark 3 – The first of those pictured above. 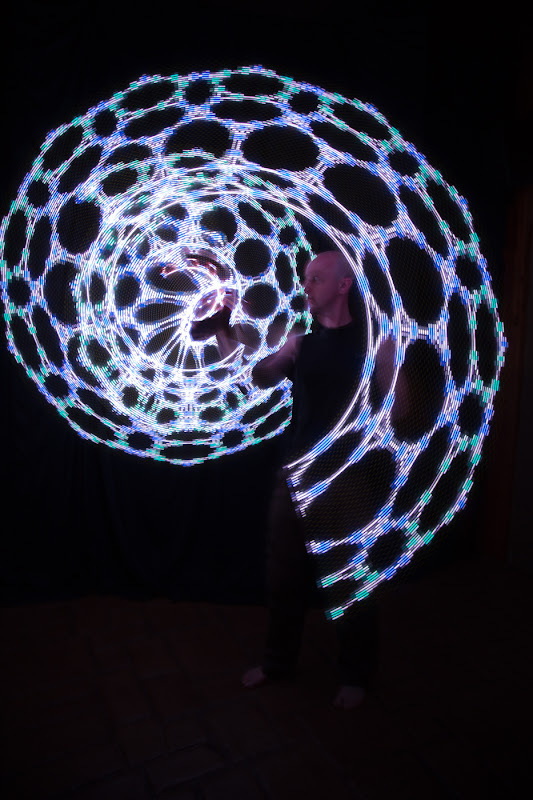 44 LEDs controlled by a Picaxe. Twenty-eight bytes of memory, home-etched circuit boards, sketchy wooden parts, and bubble-wrap. Mark 4 – First to use LED strips, 88 LPD8806 controlled by an Arduino Nano, twenty NiMH cells, and 3D printed parts. 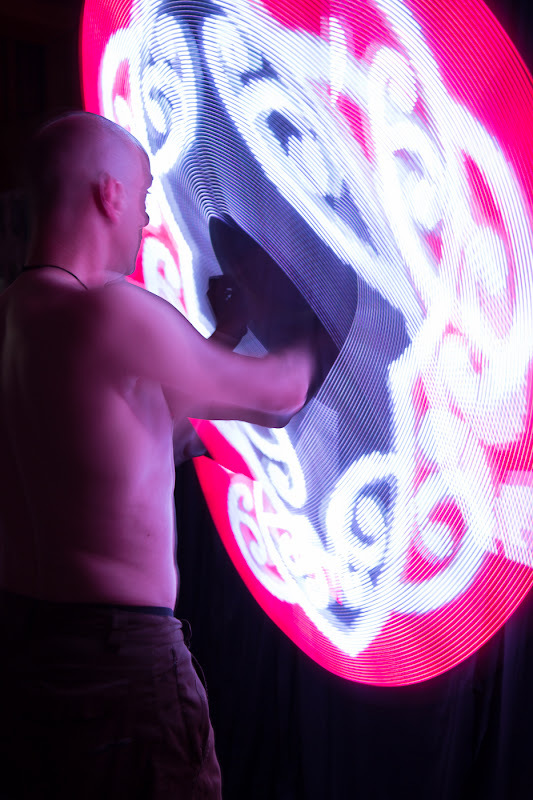 Eventually became bomb-proof enough that various I was happy to let randoms play with it at festivals. 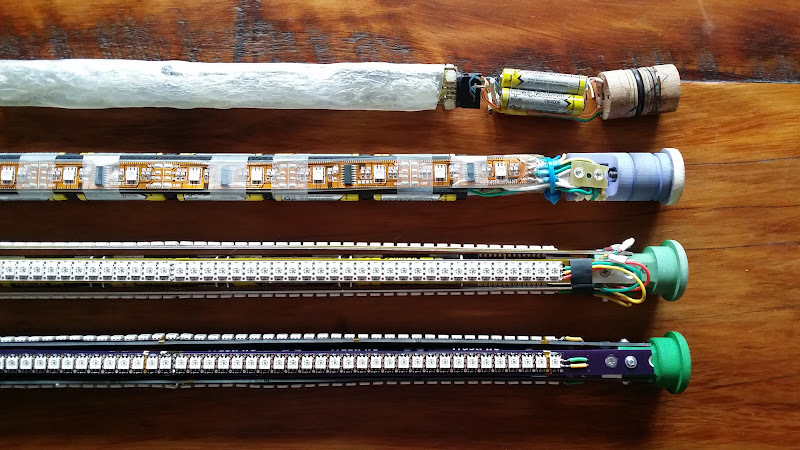 Mark 5.2 – Teensy 3.1, 800 NeoPixels as four parallel strips of 200, and lithium cells. It looked good at Burning Man until the overloaded Voltage converters tried to catch fire. Mark 5.3 – The brief details are: twelve 14500 Lithium rechargable cells powering 800 APA102/DotStar LEDs in four strips, controlled by a Teensy 3.2 microcontroller, with a motion sensor to turn it on and off, running the wonderful FastLED library and my own multitasking code to display a hundred images. You may have seen version this at Kiwiburn this year. The not-so-brief details are explored below, with an emphasis on the inevitable trade-offs that you face when trying to push to the boundary of what’s possible. First limit is size, because here we’re trading off between ease of holding, stiffness, and internal diameter. The outside diameter of the tube can only be so big before it gets hard to hold. 32 mm is already fatter than I’d like for a staff. The only possible material for the tube is polycarbonate and that’s pretty flexible stuff. That diameter tubing comes in two choices of wall thickness and 1.6 mm is like a noodle. So 3.2 mm wall it is, giving a 25.4 mm inner diameter. That fact alone drives the rest of the design. Second limit is energy storage. I want this to be kicking out the lumens all night long, or at least as long I last at a festival. (So that’s till about half-way through the night when everyone is kicking off and I say “I’m just going back to camp to get more water” and then I sneak off and crash out. But I digress.) I also want to fit four LED strips along with the necessary wiring and internal structure. Turns out 14500 cells (AAA size) fit, with about a quarter of millimetre spare. Twelve of them give me 33 Watt-hours, which is sufficient. Splitting them into two groups puts the heavy cells at the tube ends for good weight distribution when spinning. Keeping those two groups as one pack, i.e. all the cells in parallel, makes charging so much easier. 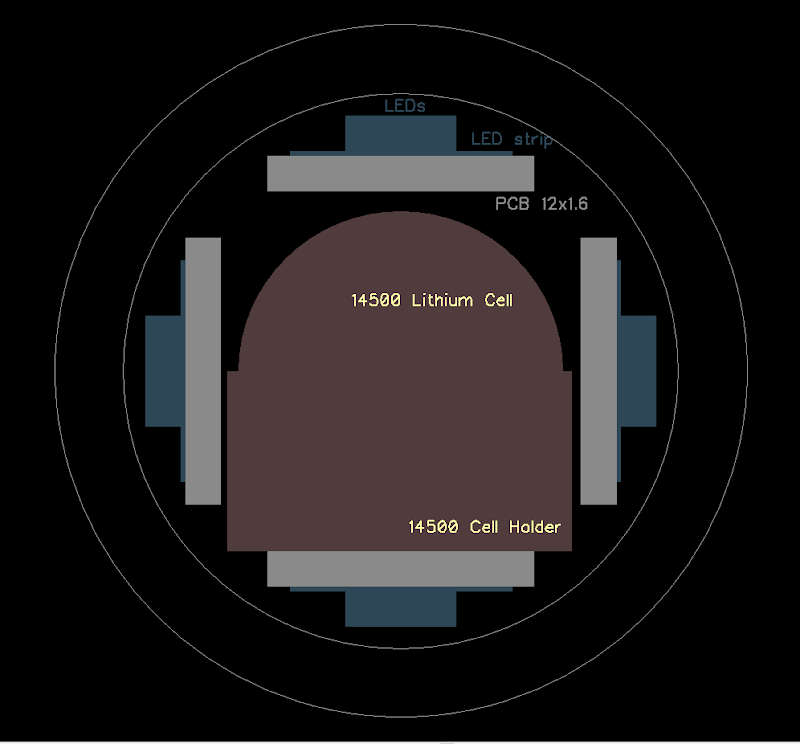 Charging from USB is handled by Peskie Products tiny 800 mA board. Fourth limit is features. Here the trade-off is between time writing code (and getting it to work) and just building the bloody thing. I’m at the point where it does images. 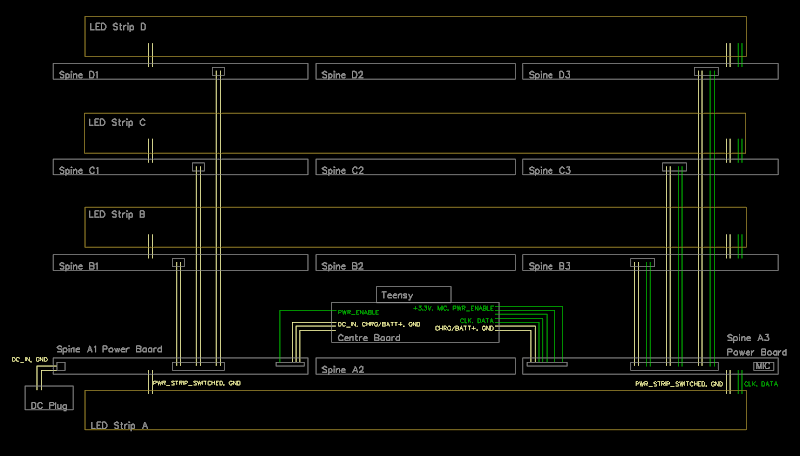 It doesn’t visualise music, yet, but that’s the plan for Mark 5.4. Fifth is durability. Making a long, thin electrical device and then repeatedly throwing it on the ground is just hard. So everything is solidly mounted, there’s 3D printed ninja-flex bumpers at the ends, all structural parts are aluminium, thick 3D printed nylon, or FR4. All wires are as short as they can be, with locking connectors. All solder connections between parts that could move are sewn. 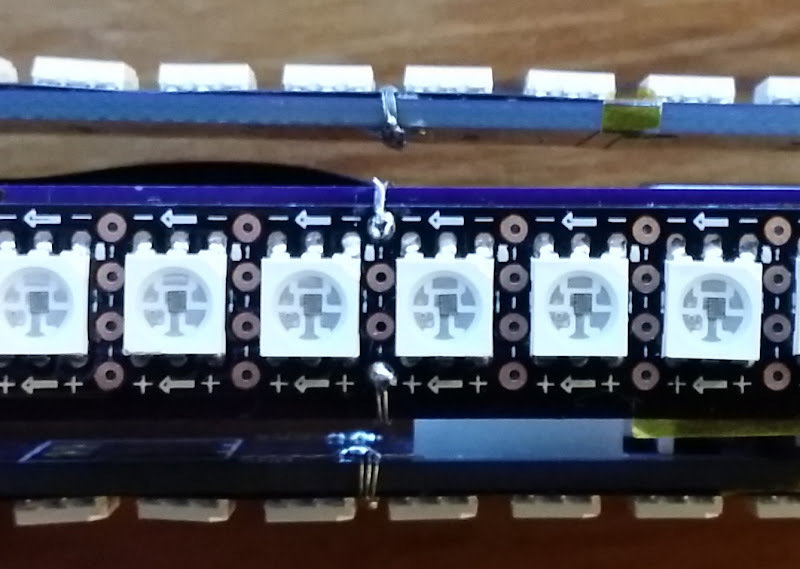 All cell holders are screwed in place as well as soldered. Power architecture – the great thing about APA102 LED strips is that they will happily run off 3.7 Volts, meaning no need to step Voltages up to 5 Volts as with NeoPixels. (They also just work, unlike NeoPixel’s tricky timing requirements.) This simplifies the power architecture greatly and avoids using UBECs. The downside is that they pull 1 milliAmp per LED even when the LEDs are set to off. 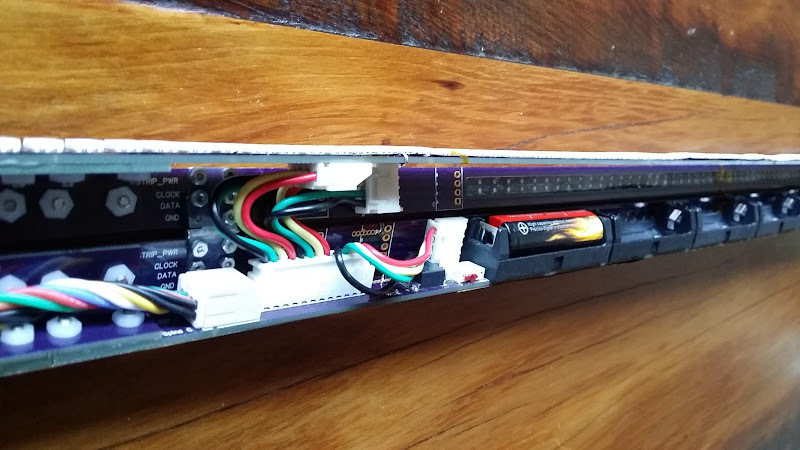 I don’t have room for a physical power switch, so to keep the stand-by life at more than a day, there’s MOSFETs between cells and strips which cut or enable power to the strips. This also allows for control of the strips on start up – the Mark 5.2 didn’t have this. On power-up, the NeoPixels could light before the microcontroller had booted up, getting stuck in a high-current draw mode, preventing the Teensy from starting and damaging other components from overheating. The Mark 5.3 holds power off to the strips until explicitly commanded by the microcontroller. Overall Arrangement and Physical Alignment – Accuracy is hard. Or rather, accuracy is expensive and time consuming. Squeezing everything in gets to be a pain in the arse, when you have quarter-millimetre tolerances. Making everything stiff enough and strong enough is bonus arse pain. So rather than try to make structural components myself, I used the PCBs as structure, alignment, and circuitry. Board shops will happily drill holes for no cost with micron accuracy. Then everything just screws together and fits together. The four sides are in two pairs with L-brackets holding each pair. There’s hinges between each pair so you can remove the internals and open the whole thing up for access. Physical power switches – I said this doesn’t have room for one. It doesn’t, at the ends. One end holds the charging port, the other the microphone. I probably could squeeze one in, but there’s lots of current so the switch isn’t going to be small and the ends are the parts that get most knocked-about, so it’s not going to be durable. Still, power switches are necessary for debugging and resets, so there’s two tiny, board-mounted six Amp switches, one for each battery pack. The code is all built on Alan Bleaklow’s Very Simple Arduino Task Manager. Every feature is an object that gets called every X milliseconds. 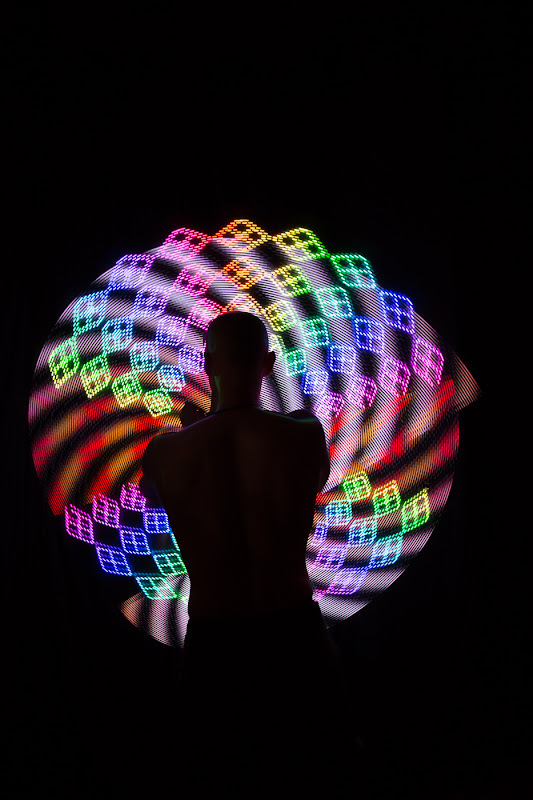 The pattern generator and display refresh run every 2 milliseconds; the motion sensor every 250 milliseconds when spinning and every 500 milliseconds when stationary. Communication between objects is by message passing, with a SwitchModes object running a finite state machine to hand smooth transitions between spinning, ambient, and timed-out modes. Transitions between images happen every few seconds, or on reversal of the spin direction. The transitions are sharp, but could be gradual. This code is probably a bit over the top for just displaying images, but is a solid platform for more complex behaviour. The interface is entirely motion-based. Spinning wakes it, not spinning drops it into mellow ambient modes, rolling it turns it black. 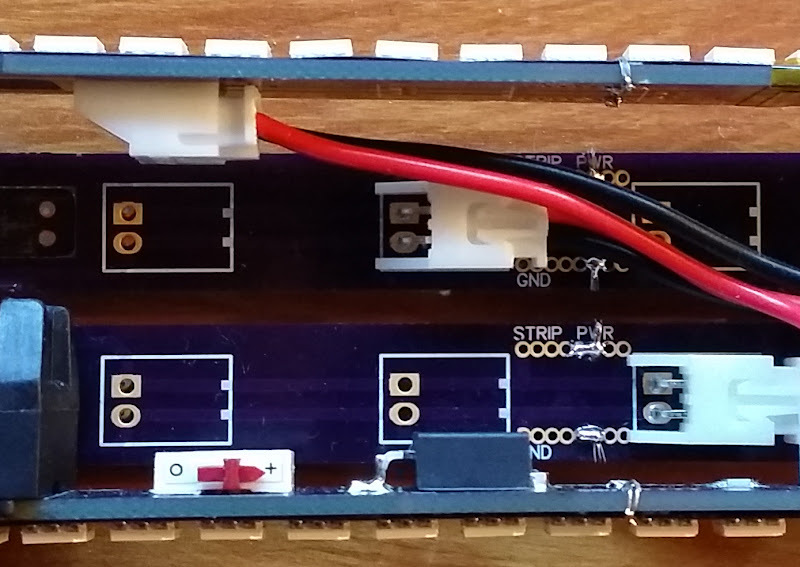 With a Teensy at 72 MHz and data to strips at 10 MHz, updating 200 LEDs takes 1.5 ms. The display aims to update every 2 milliseconds, leaving 0.5 milliseconds to get new the next column of image data or generate the next frame of a pattern, or do other stuff. This is plenty. Some are 256 colours, most are 16 colour for two pixels per byte. Images are 32, 48, or 72 pixels high. 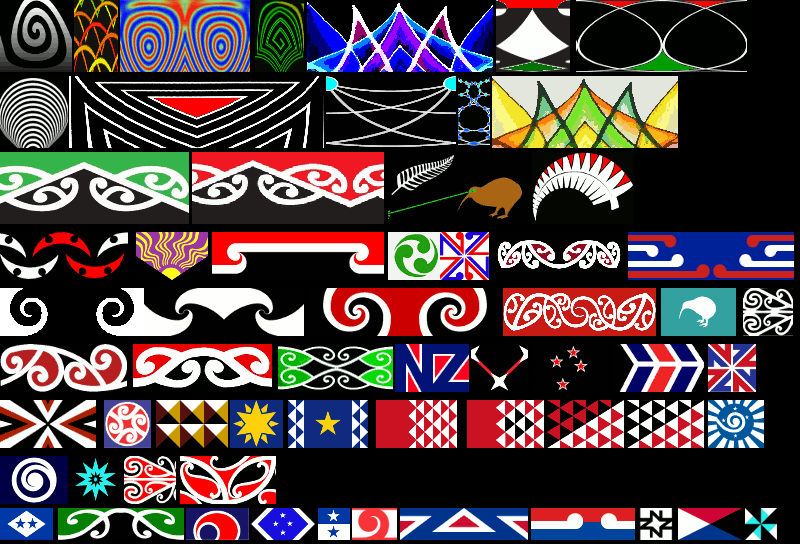 So I rounded up a heap from the flag competition, along with lots of traditional tuktuku and kowhaiwhai patterns, and some mandala drawn by Spiralishis, and some mathematical designs sourced from Wikipedia. Some of these were tweaked in Gimp with conversion to polar co-ordinates, shifted, and faded brightness in the rectangular originals to give round and even brightness in when displayed by the rotating Mitochondrion. 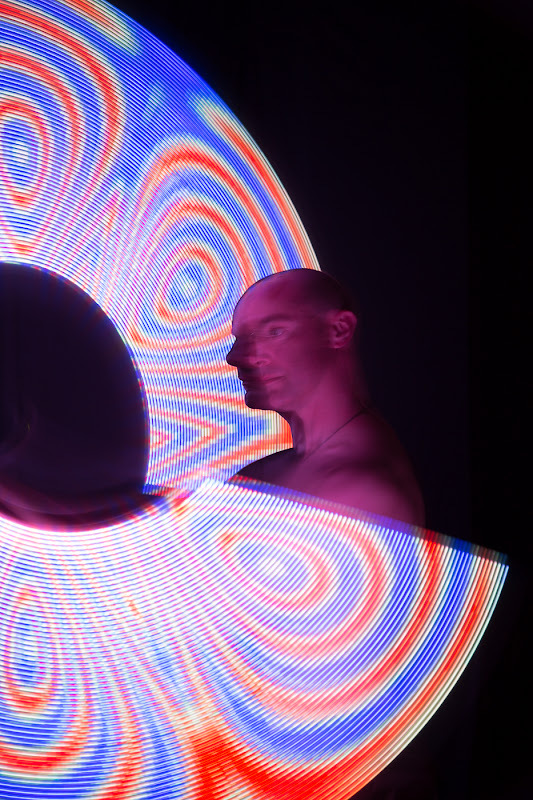 The images are processed from GIFs by a hacked version of Philip Burgess’ LED poi converter. It takes a directory full of images and writes out a header file full of image data and palettes, which then gets picked up by the compile. 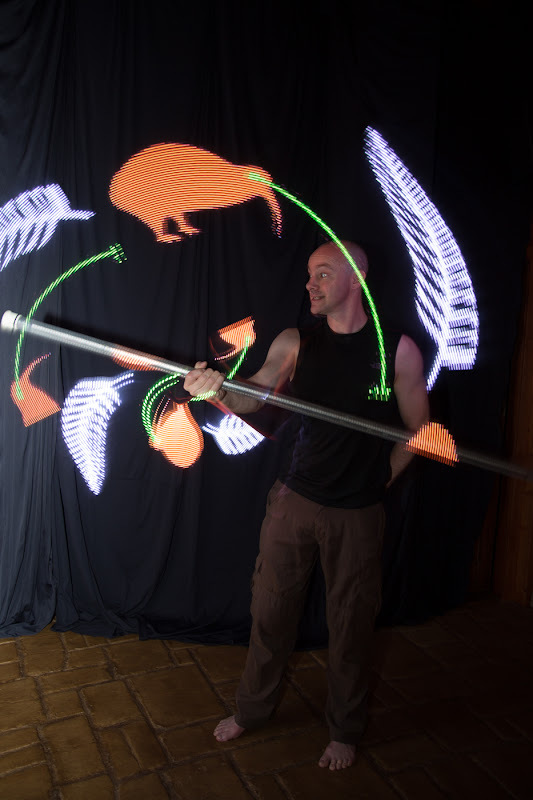 And of course, we had to include Laser Kiwi. It’s the People’s Choice! I’ll admit to being quite pleased with this version. All spinning pics by Gordon Lehany of Platnam Images, who mostly does landscape and event photography, and platinum printing, but is game. Very stoked that you posted this, I’ve long been fascinated as to the finer details of this project. wow, so cool!!!!!!! words obviously do not suffice. Wow, looks amazing! Hehe you linked to my Etsy shop – I forgot it even existed! Now I’ve seen the capabilities I’m super keen to send some designs your way, well I will when I find some time, yep, I’m sure it exists somewhere in the world. Do you have any files you mind posting? Like the code or the PCB files for your strips?